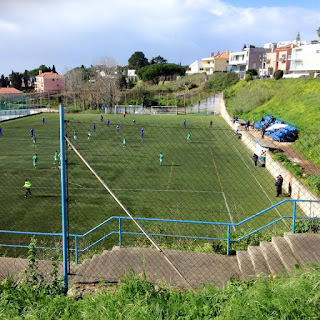 Clube de Futebol Os Belenenses, commonly known as Belenenses, is a sports club from the suburb of Belém in the Portuguese capital of Lisbon, who are best known for their football club. The club was formed on the 23rd September 1919, and has sections for handball, basketball, futsal, athletics, and rugby union as well as football. The football team soon came to prominence when they reached the final of the Campeonato de Portugal in 1925-26, which was the forerunner to the Taça de Portugal. 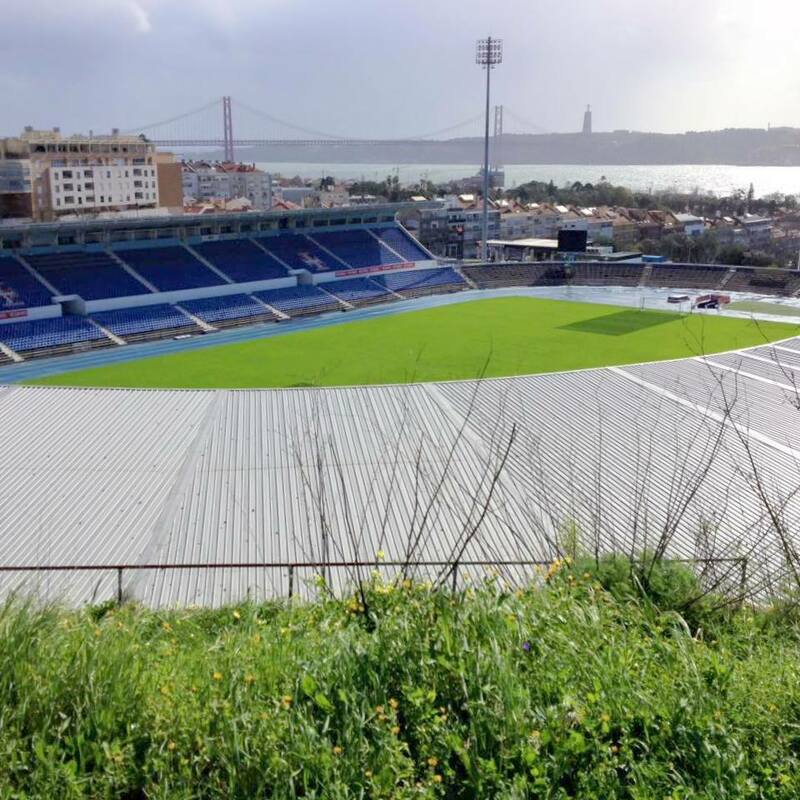 They lost that final 2-0 to Maritimo at the Campo do Ameal in Porto, before bouncing back to win the title with a 3-0 victory over Vitória de Setúbal at Lisbon’s Estádio do Lumiar the following season. 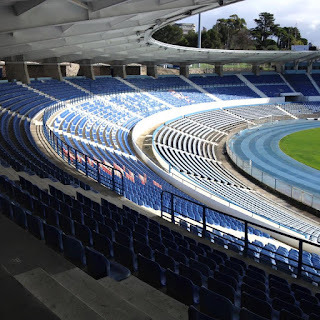 Further success followed in 1928-29 as União de Lisboa were defeated 3-1 at Campo de Palhavã, Lisbon as Belenenses won the Portugal Cup for a second time. It was during this period that José Manuel Soares, known as Pepe played as a forward for the club. He was the star of the Portugal national team scoring seven goals in fourteen games. Pepe died of food poisoning in 1931 at the tender age of twenty three. He is regarded as one of the country’s greatest ever players. 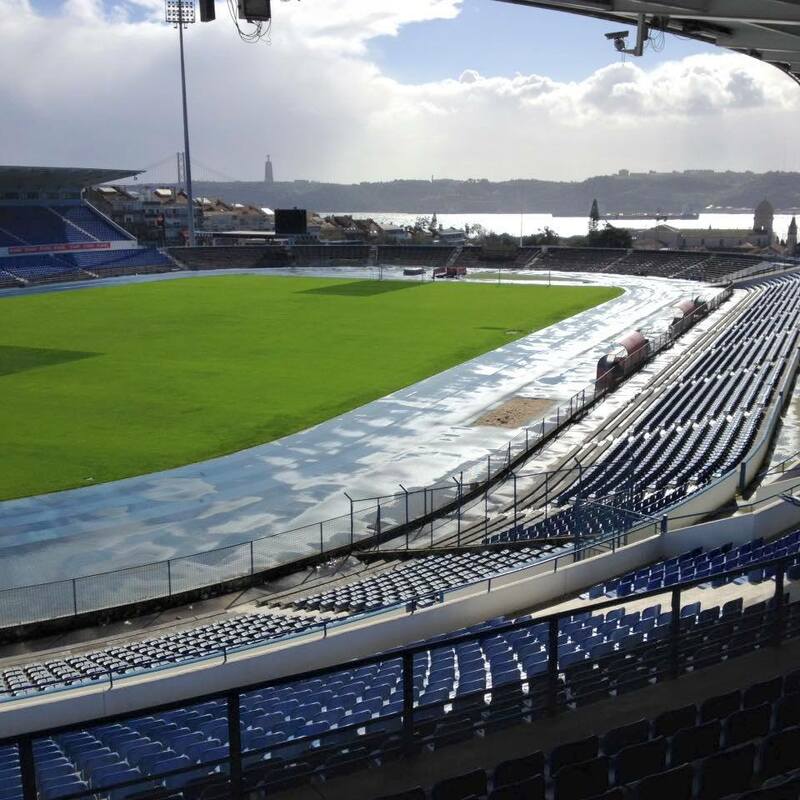 Belenenses home stadium, Campo das Salésias was renamed the Estádio José Manuel Soares in his honour. 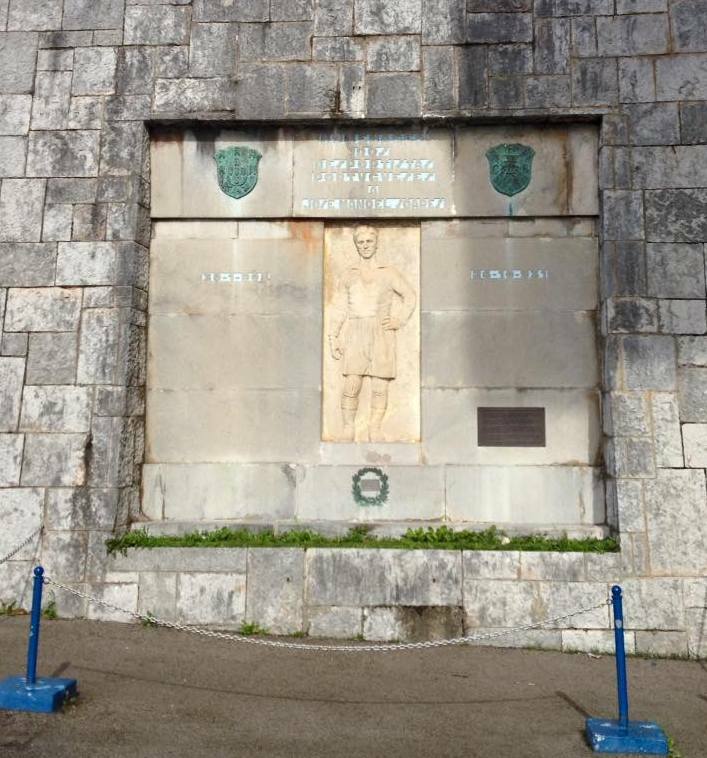 In 1931-32 ‘O Belém’ lost the two legged final to FC Porto at Campo do Arnado in Coimbra. 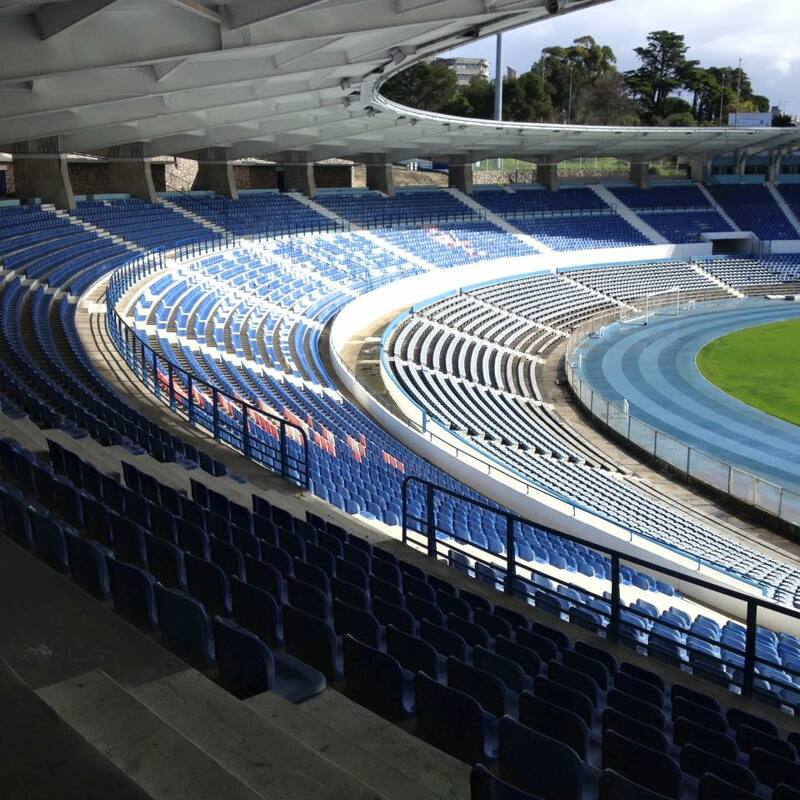 A third cup win came in 1933 as Sporting CP were defeated 3-1 at Estádio do Lumiar, Lisbon. With the advent of the Primeira Divisão in 1934 (which would later become the Primeira Liga), Belenenses formed part of the ‘big four’ of Portuguese football. 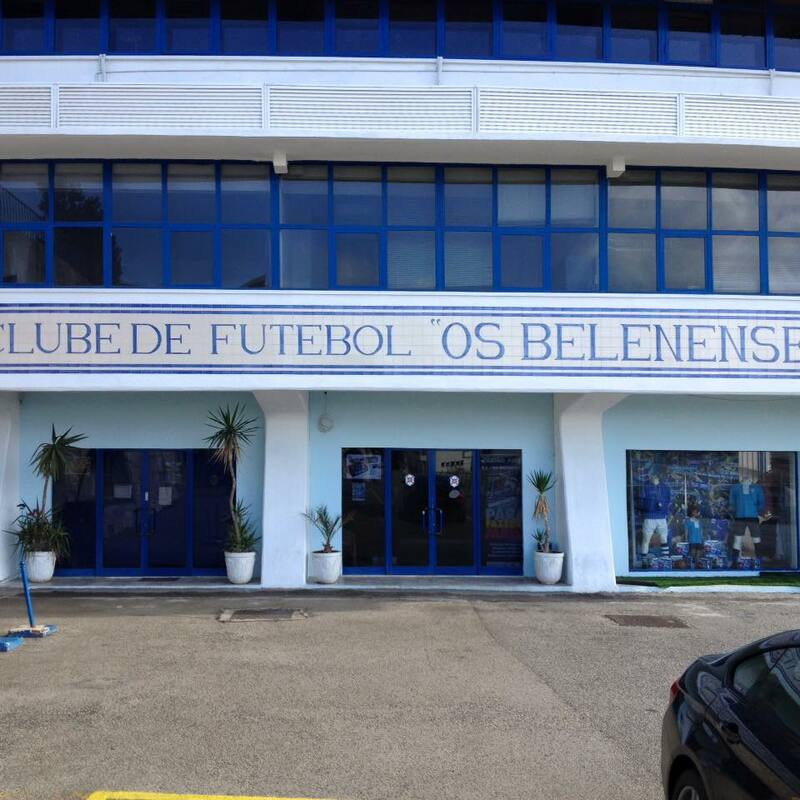 Following a series of five third place finishes in Primeira Divisão in six seasons, Belenenses were crowned as league champions in 1945-46. 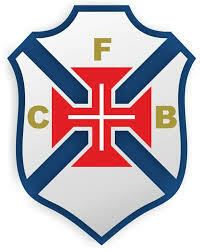 The club were enjoying a golden era as they reached the final of the Taça de Portugal in 1940 and 1941. 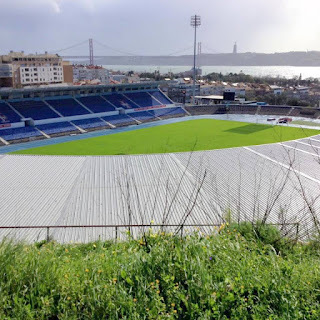 On the first occasion they were defeated 3-1 by SL Benfica at Estádio do Lumiar, with Sporting CP winning 4-1 the following season at Campo das Salésias. 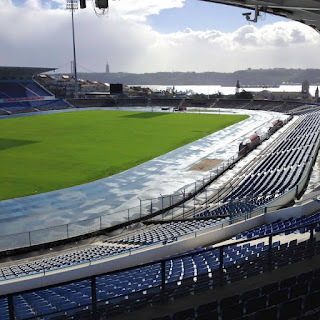 Belenenses lifted the Taça in 1942 as Vitória de Guimarães were defeated 2-0 at Estádio do Lumiar. 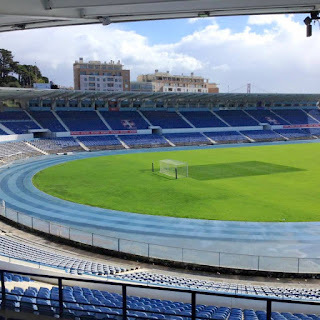 In 1948 the team returned to the second ever final to be played at Estádio Nacional where they went down 3-1 to Sporting CP. In 1954-55 the club finished as runners-up to SL Benfica in Primeira Divisão before winning the Taça with a 2-1 win against Sporting CP. The 1961-62 season was the first of four consecutive campaigns in the Inter-Cities Fairs Cup. Matches against FC Barcelona and AS Roma would be the highlights. The club continued to finish to the top half of the table until they finished the 1972-73 season as runners-up under Argentinian coach Alejandro Scopelli. 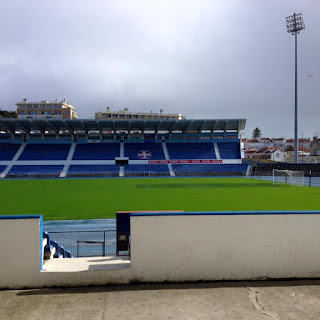 A third place finish three seasons later was the highlight before the Belenenses team under Nelo Vingada were relegated to the second tier for the first time. English coach Jimmy Melia led them back to Primeira Divisão in 1983-84. In 1986 the club reached the final of the Taça de Portugal but were defeated 2-0 by SL Benfica. They were to avenge the defeat in lifting the Taça against the same opponents in 1989 with a 2-1 win under the guidance of John Mortimore. In 1990-91 another relegation was suffered, but Abel Braga’s side went straight back up at the first attempt. 1997-98 saw another demotion, but once again Belenenses regrouped and won an immediate return to the top flight. In 2007 Belenenses once again reached a Taça de Portugal final, but they were defeated to a solitary goal against Sporting CP, leading to a place in the UEFA Cup where they went out in the first round to FC Bayern München. 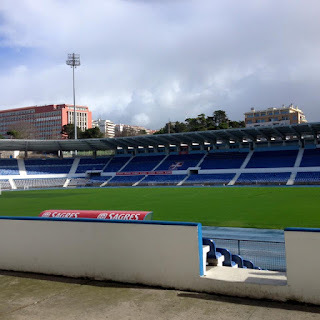 Toni Conceição was in charge of team affairs as Belenenses were relegated in 2009-10, It would be left to Dutchman Mitchell van der Gaag to take the side back up in 2012-13 as the Segunda Liga title was lifted, as well as reaching the semi-final of the Taça. 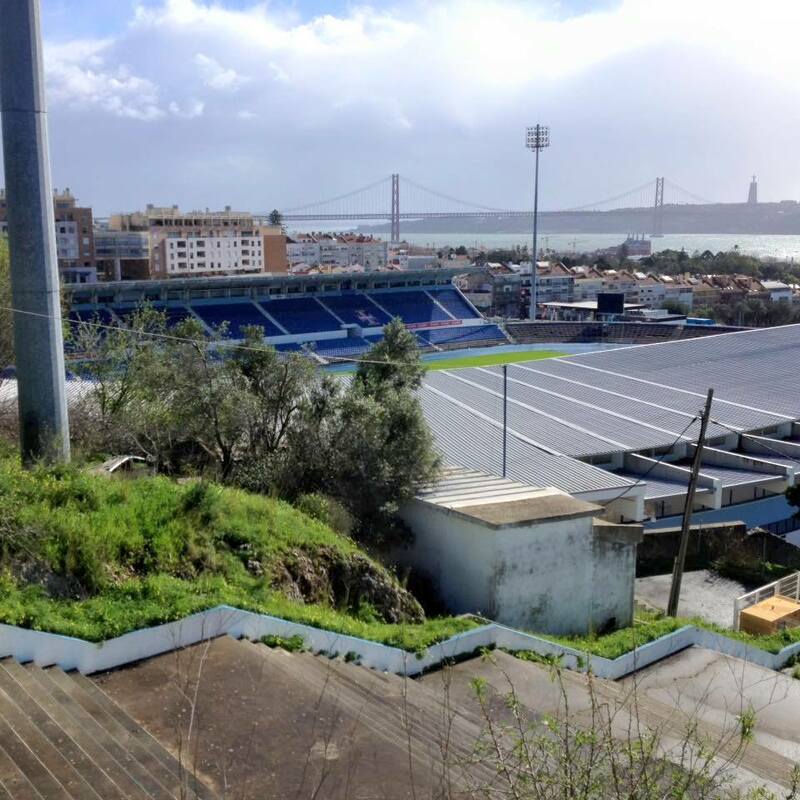 Estádio do Restelo. Ricardo Sá Pinto’s team went out in at the group stage following games with Basel, Fiorentina and Lech Poznań after victories over IFK Göteborg and Rheindorf Altach. Belenenses will play in the Primeira Liga in the 2015-16 season. 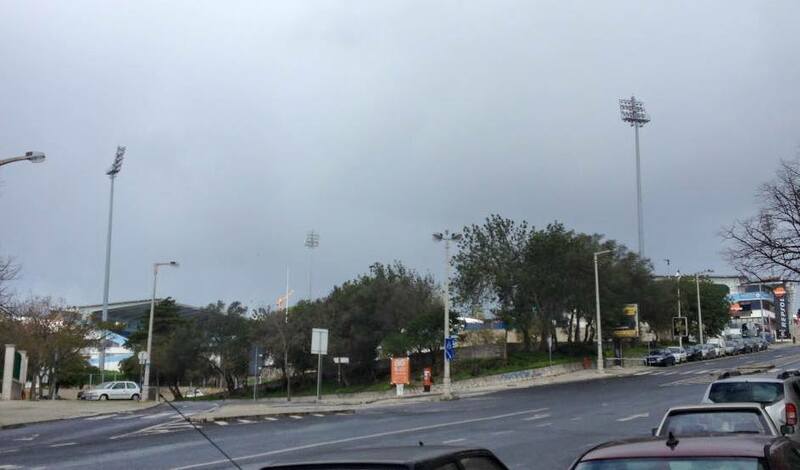 My visit to Lisbon for a long weekend was going well despite the inclement weather. At last the sun had come out, but it was interspersed with heavy showers and a biting wind. Following my visit to Atletico CP, I took the packed tram full of tourists to pretty Belém before climbing the steep Rua dos Jerónimos to the stadium. 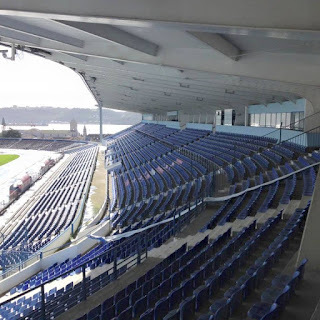 There was no entry from the road side, so I went round to what happened to be the Main Stand. 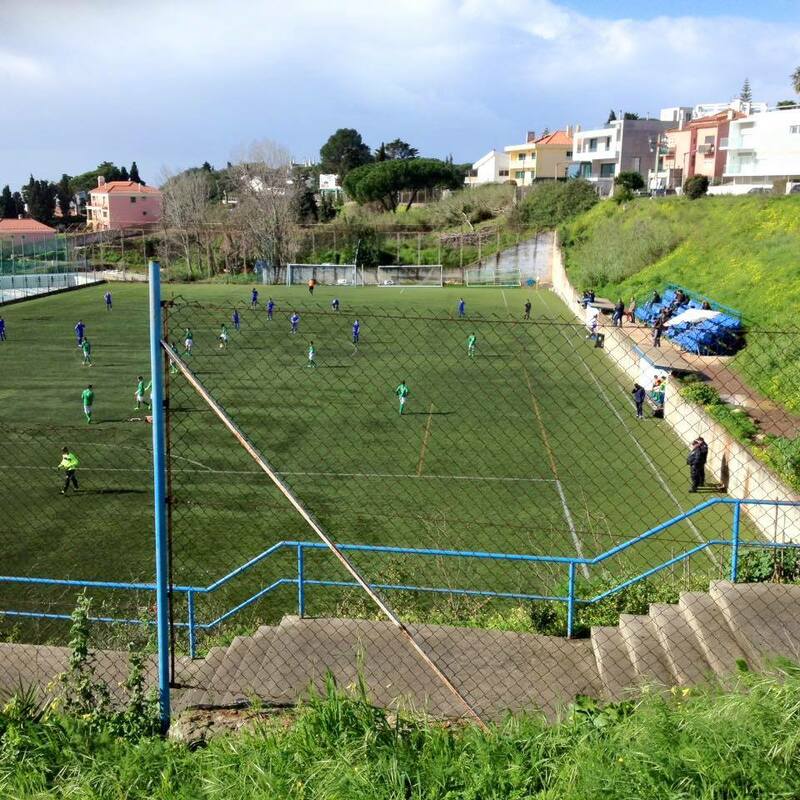 There were two under age matches taking place on the pitches built into the hill. Both had attracted fair crowds and both pitches had their own catering facilities. Another smaller pitch had game going on. 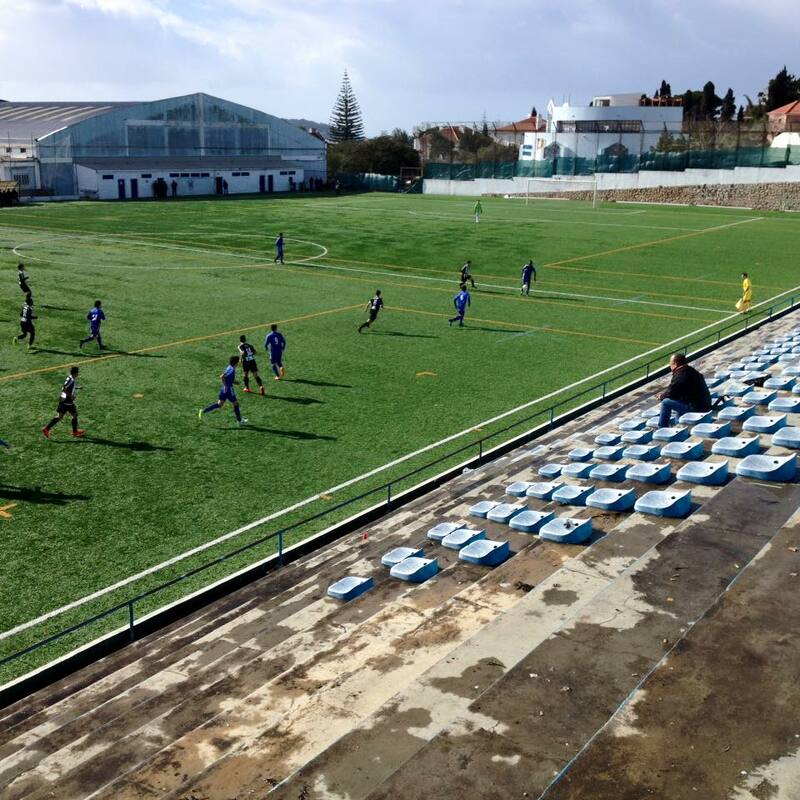 All were being played on artificial surfaces. 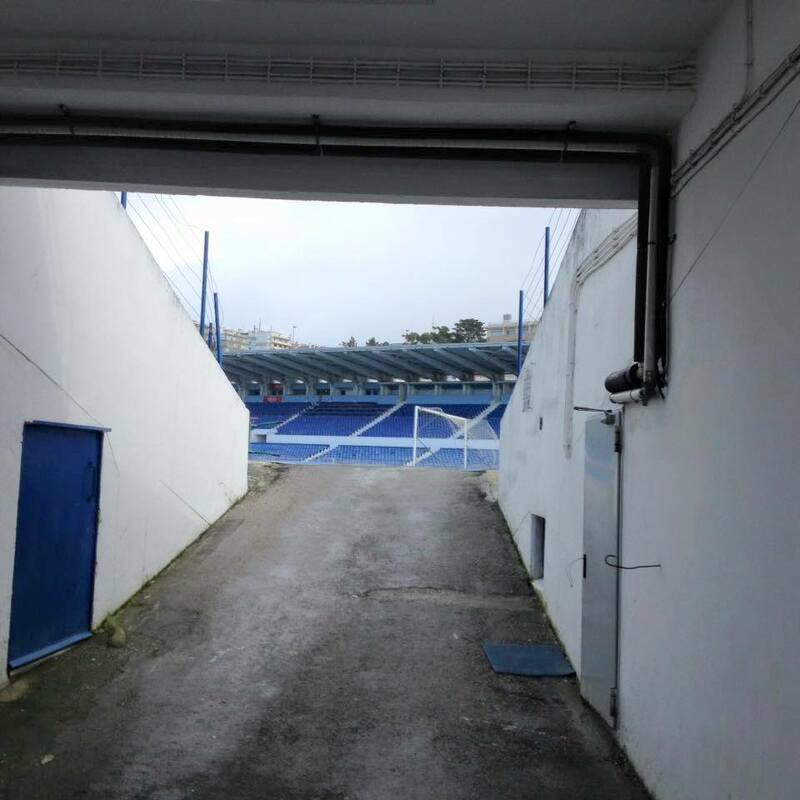 However, it didn’t look like I was going to get inside Estádio do Restelo. I sought consolation by climbing a set of steps and getting a superb panoramic view with the Ponte 25 de Abril suspension bridge straddling the Tagus in the background. It was at my vantage point that I spotted a possible solution. Sure enough, my eyes had not let me down. The gate by the groundsmans’ entrance had not been locked. I was inside a really impressive arena. In many ways it was like a smaller version of the old Rheinstadion in Düsseldorf, with a horseshoe roof with one smaller end left open. 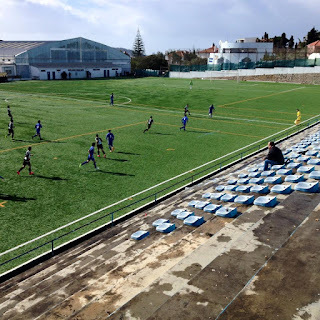 The sides had corporate facilities built into the stands, with a blue athletics track encircling the lush green pitch. After taking plentiful photos I closed the gate behind me, leaving just the stadium cat to oversee its home. 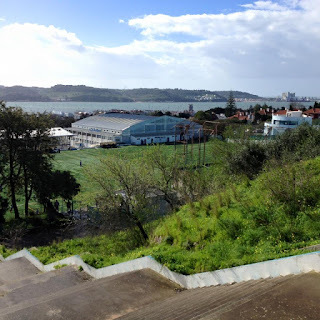 The walk back down the hill was a lot easier, and I took a short bus ride to head towards Belém station for a ride to Cruz Quebrada for another climb up the hill to Estádio Nacional, Jamor.